I found beautiful free pattern for a blanket and I decided to use it as part of poncho I was going to make. And here it is for all of you. At first you need to make 4 squares. For the front one I used a free pattern for the blanket I found here: http://www.ravelry.com/patterns/library/square-and-ripple-blanket . The final size of the square is 48cm x 48cm (19”x 19”). You can see in the picture below. 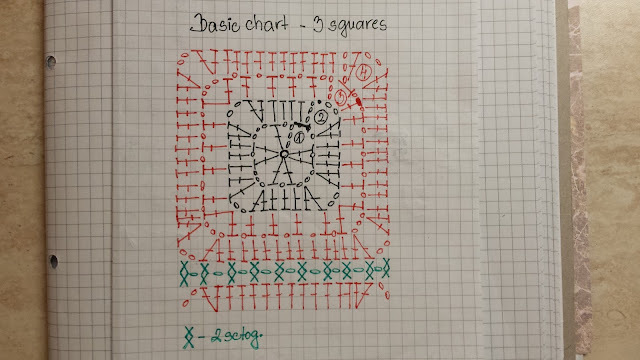 For the back square and side squares I used a moderated granny square. You can see the picture with color combinations above and a simple chart below. You can use any square you like. This one just suited my purposes. I joined the squares by 2sctog, from each of the two squares, ch1, skip 1 on each of the two squares (green writing). You can see the detail and chart on the pictures below. 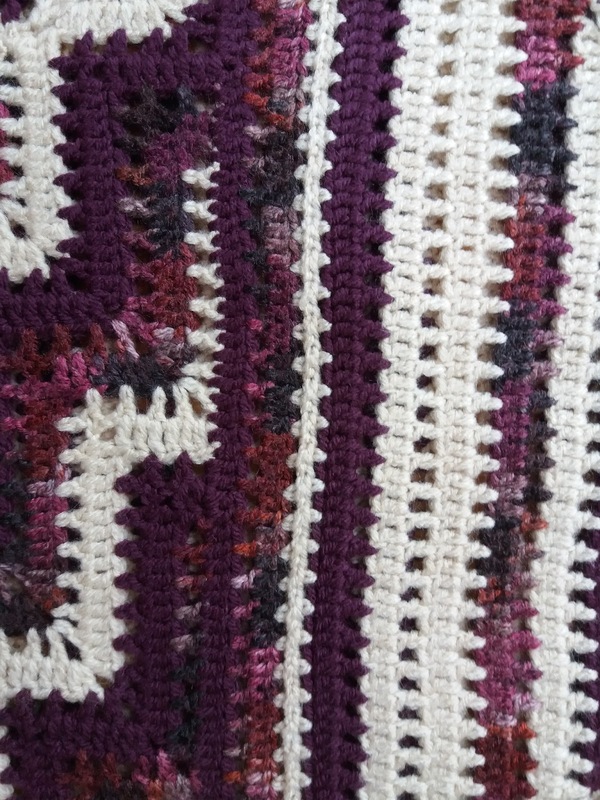 Again, you can use any stitch for joining the squares you like. 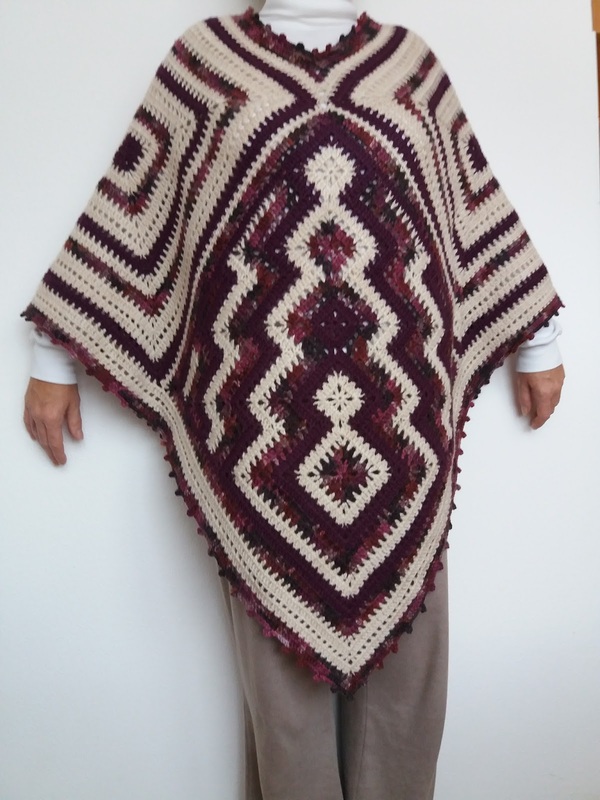 I went around the whole poncho using the same pattern as you can see on the basic chart (pictured above) – round 3 and 4 (red writing). 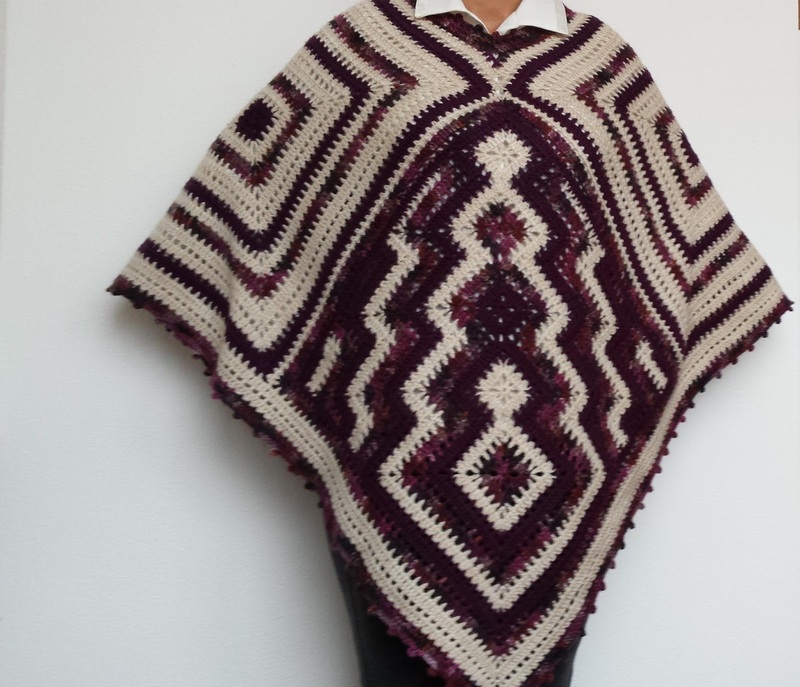 I made one more “picot” round – Starting in any of ch2 corners, join the yarn, ch4, slst. in the same ch2, (slst. over next 6 st., ch4, slst. in the same st.), repeat () all the way around. You may need to moderate the number of sls. between ch4’s a little towards the end. I worked the neckline in the same way as the corners on the main front square. I made a link to the pattern above. I think it’s a very well written pattern, with lots of charts, easy to understand, and it has many variations to choose from. Then I finished with a “picot round”. And there it is - a very noticeable Poncho. The main square is interesting, with many variations and the pattern is suitable for dedicated beginner as well.